KOI BREEDS: Koi fish, often referred to as Nishikigoi, are the product of hundreds of years of select breeding between common Asian and German carp. Different koi breeds can be found in a variety of colors ranging from pure white to yellow, orange, red, blue, black, even green! Their patterns and color combinations are unique to each individual koi fish. The most popular koi are typically a combination of red, black, and white. Some koi come with long fins (Butterfly Koi) or can be breed without scales (Doitsu Koi), giving them a sleek, streamline appearance. 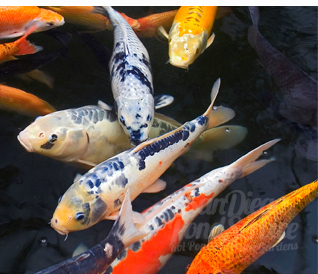 Koi ponds whose koi breeds are well represented and balanced in numbers really show well. Everyone has their own particular favorites, what's yours? 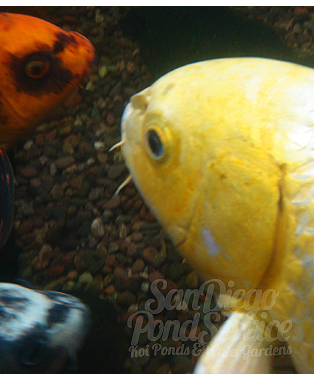 At San Diego Pond Service, we enjoy observing and caring for all types of exotic, beautiful koi! Kohaku are red and white koi with an even intensity of color. The main color should be snow white, with no yellowing and should exhibit a fine luster. Patterns are “stepped” and are recognized by consecutive islands of color. A classic Kohaku exhibits strong red coloring on it’s head, followed by a 3 or 4 “stepped” pattern. “Tancho” Kohakus exhibit 1 lone head marking followed by a distinct “stepped” pattern. Kohakus are a must for every koi fish pond. The most common of the Japanese koi. The stand alone color on the head makes this koi a Tancho and is judged in a separate class. Ideally, the Tancho marking should be centered and circular in shape, resembling the sun pattern on the Japanese flag. A very symbiotic fish in Japan. A full grown Tancho should be pure white in color with the one distinct red “Tancho” mark on it’s head. Another prized fish in Japanese koi culture which is held in high regard. A quality Tancho should exude brilliant whiteness on it’s body. Since this is it’s dominate color, it needs to shine. Once known as the Taisho Sanke, or Taisho Sanshuko, koi of the Sanke variety look very much like Kohaku that have been spattered with ink. As a matter of fact, the two varieties, Sanke and Kohaku, are closely linked and are the only koi varieties with traceable bloodlines. A Sanke looks like a Kohaku combined with a Bekko. The red color should be deep and even, and well balanced when viewed without the black sumi. On the other hand, the black sumi should also be well balanced when viewed separately and should not extend below the lateral line. All the markings should have distinct edges separating the colors and the skin, which should be a snowy white. A great addition to your pond! Traditionally, the dominant color in a Showa is their red, with black sumi and white in roughly equal proportions. If more than half the body is red when viewed from above, the Showa is referred to as a Hi Showa. But whereas an Aka Sanke is not a very subtle fish, its Showa equivalent can look stunning. This is due to the amount of black sumi in the pattern, which needs very little white to accent it. This effect is helped along by the pectoral fins and their motoguro, although clear white fins are now acceptable in modern Showa. Hi Showa are sometimes difficult to distinguish from Hi Utsuri, but if any white skin is visible when the koi is viewed from above, the koi is a Showa. One of our favorite koi fish. Like a Kohaku, Shiro Utsuri are classically simple, two-colored koi. It’s body should be the color of pure snow with a healthy, yet subtle sheen. A Shiro Utsuri is a black fish with white markings, a Shiro Bekko is the reverse, and all Utsuri sumi is of the typical Showa "wraparound" type. The sumi should ideally be jet black and glossy, as in Showa. A fault is too much black on the fins. Rather than neat motoguro on the pectorals, low-grade Shiro Utsuri exhibit solid sumi at the ball joint, which radiates outward. If this sumi is excessive, the whole fin will appear black. Dorsal and caudal fins are allowed some sumi, but again, if there is too much, the koi will appear unbalanced. Ki Utsuri is a very old variety traceable back to 1875, at the beginning of the Meiji Era. Eizaburo Hoshino, who was also responsible for improving Sanke bloodlines in the early twentieth century, coined the term "Ki Utsuri" for this yellow and black koi. Before this, they were earlier known as Kuro-Ki-Han. Head patterning of Ki Utsuri can range from the classic lightening strike or V-shape shared with Showa, to relatively small counterpoints on the yellow skin. These don't have to be symmetrical, but they are a must for every koi fish pond. Probably the most common in your typical Japanese koi pond. Hi Utsuri are best viewed as a Showa without the white. Until recent years, the hi was rarely scarlet, but out crossings with Kohaku have greatly improved upon this variety. Some breeders have also reintroduced Magoi genes into their strain of Hi Utsuri, which allows the koi to attain a greater size without any falloff in pattern or skin quality. the pectorals rarely s the edges should be clearly defined. Too much black on the head, makes for an inferior koi. About 30 years ago, when koi keeping began to take off outside of Japan, the Bekko variety was quite fashionable, but like most fads, the popularity of this koi diminished over time. Though they may be hard to find, good specimens are truly stunning in their simplicity. Out of the three types of koi that are recognized as Bekko, only one - the Shiro Bekko - is widely known. Shiro Bekko is a Sanke derivative. Although they are still produced from parent fish of this variety, they are just as likely to be seen from spawnings of Sanke, especially Tancho Sanke. Bear in mind that any hi at all on a Shiro Bekko, even on the lips, technically makes it a Sanke. Aka Bekko, never to be referred to as Hi Bekko, are red koi with Bekko sumi markings. Ideally, the body of Aka Bekko should be a scarlet red hi, overlain with deep sumi and offset with pure white or clear finnage. The only koi likely to be confused with Aka Bekko are Aka Sanke; the singular difference being that Aka Sanke show white areas on the body when viewed from above. Aka Bekko are allowed some hi in the finnage, which tends to appear in blotches rather than stripes, although pure white pectoral fins are most pleasing.kin is visible when the koi is viewed from above, the koi is a Showa. Another one of our favorite koi fish. Ki Bekko are the rarest koi in the Bekko group. The Ki Bekko sport a lemon-yellow body overlain with the black sumi. They are not a variety deliberately spawned, but may arise from Shiro Bekko, Kigoi or Sanke crosses. Curiously, the metallic equivalent of a Ki Bekko (known as a Tora, Tiger, or Ogon) is quite commonly seen.audal fins are allowed some sumi, but again, if there is too much, the koi will appear unbalanced. Beautiful, rare koi fish. Their white fins against it’s yellow body is a brilliant contrast. Asagi are fully scaled, nonmetallic fish with a long history. Some pond owners see them as unrefined, dull, and not proper koi at all. Certainly they are an acquired taste, far removed from the brilliantly tri colored modern Showa or the flashy koi grouped in Hikariutsuri. But their quiet elegance serves as a counterpart to their more exotic pond mates and they also have the potential to grow very large. Probably the most common of the Japanese koi. Ideally, the back of an Asagi should be evenly covered in scales that are pale blue at the spot where they enter the skin, but are a darker blue as they grow out. The sharper the definition between the shades, the more impressive the koi. Shusui means “autumn water” in Japanese. At first sight, these mirror-scaled koi seem to have little in common with Asagi, but Shusui are actually the product of crossing Asagi with a German mirror carp in 1910 by Yoshigoro Akiyama, resulting in the very first Doitsu scaled koi breed. The color distribution is essentially the same as in the Asagi, but because there are no normal scales to give an overall reticulated effect, the smooth, sky-blue back is instead highlighted by the Doitsu scalation. In good examples, these armored scales form a regular pattern on the shoulders of the koi and then run in two lines on either side of the dorsal fin, returning to a single line towards the tail. This is a white koi with the hi pattern similar to Kohaku, but each red scale is edged in black or dark blue, reminiscent of their Asagi ancestry. Good Ai Goromo are judged much like good Kohaku, with all the qualities expected of that variety: snow-white skin, deep crimson hi, and an interesting traditional or modern pattern. The dark lining along the scales appears only faintly when the koi is young and may take years to come out fully. Too much sumi early in life is an indication that this color will eventually overwhelm the koi. But in mature koi, the sumi should be evenly distributed over all patches of hi, with the exception of the head. This is probably the most diverse koi variety known. Goshiki, meaning "five colored" in Japanese, are said to be five-colored koi, although sometimes you'd be hard pressed to pick out the red, black, white, light blue, and dark blue color tones that are said to be available. Even further, a sixth color - purple - is formed when black and blue overlay one another. Goshiki have strong Asagi lineage, which lends a reticulation to some or all of the scales. Gin-Rin Goshiki and Doitsu Goshiki add even more complexity to an already fathomless variety. Kawarimono is a broad classification used for a wide variety of non metallic koi that don't fit into other classes. Some examples are breeds of their own, while others display "one-of-a-kind" color and patterning. Furthermore, certain koi are placed in Kawarimono because they deviate so much from the judging criteria applied to what would typically be their own variety. For instance, the Kanoko Kohaku, which displays a dappled hi pattern, is benched Kawarimono because it would never be able to compete with conventionally marked Kohaku. Koi indentification information is courtesy of lackwater Creek Koi Farms Inc.
KOI GROWTH: Koi fish growth is based on their environment. The environmental impacts that affect their growth are pond size, water volume, fish volume, filter capacity, water conditions and diet. As fry, they may grow as fast as an inch per month, but their growth rates diminish as they reach full maturity. Koi naturally breed in early to mid spring. During summer, when weather conditions are warmer, koi thrive with increased activity and appetites. As winter approaches, water temps drop, along with your koi's activity. Less activity means less desire for food. 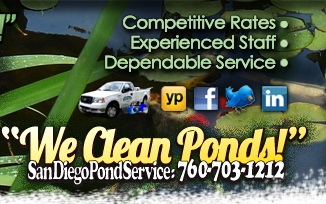 A good way to encourage rapid growth rates, especially during the growing season, is to give your pond weekly partial water changes of 5%-20% based on the amount of fish in your pond. This not only keeps your pond healthier, but it also leads the koi to believe they are living in a bigger environment than they actually are! Koi grow to their surroundings. These frequent water changes and daily feeding, during warmer summer months, will ensure your koi will rapidly grow to their potential.